While some towns have placed curfews on when trick-or-treaters can go house-to-house, many more do not have a system like this in place. Darkness, almost as much as candy, is a hallmark of Halloween. Inevitably, kids are going to run around in the dark on streets that aren’t always well lit; leaving it up to drivers to navigate roads more safely. In order to help children stay safe and, more importantly, visible, adults can use glow sticks and retro-reflectors. Not only are glow sticks fun to use and overall pretty awesome, they’re also highly visible in darkness. The chemical reaction within the glow stick lasts for hours, so your children can enjoy Halloween all night long without the stick “turning off.” Considering how affordable they are, a 12 pack is less than $5, even if the glowing part runs out, you can always grab another. While many retro-reflectors are used on signs posts, some companies have designed them for clothing attire. You may have seen runners with them on sneakers and shorts, or even construction workers with retro-reflectors on their personal protective equipment. They are the parts where if you shine a light on them, they look like they are lights themselves. While thicker, more industrial reflective tape can be fairly expensive, shoppers can pick up a 30’ roll of 1” Wide Tape for less than $20. 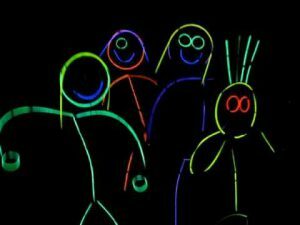 If you want to incorporate glow sticks into the actual costume, we’ve seen trick-or-treaters outline their bodies in them to look like a glowing skeleton. For retro-reflectors, you can always send your child out looking like a road construction worker. At the end of the day, even if you’re following your community’s Traffic Signs, it’s worth remembering that kids can run into the street at any time – often dressed in dark colors. With that being said, enjoy your Halloween.